Stephanie and a group of fans were invited to the launch of the book at the Royal Court Theatre on Thursday 30th May. It was a great night with fans mingling with the invited press. Selina's images from the launch are available on her site, access them by clicking here. Perry Bedden, one of the original Rocky Horror Picture Show Transylvanians, has also kindly sent us a few images to use on this site. We were given a couple of copies to give away in our May 2002 competition. Click here to see the answers to the questions and who the two lucky winners were. As soon as I knew that a new book about the ROCKY HORROR phenomenon was on its way, my biggest question was always "will it be as good as Jim Whittaker's excellent COSMIC LIGHT: The Birth of a Cult classic?" ROCKY HORROR: from Concept to Cult, by Scott Michaels and David Evans, tells the same story (the birth and growth of ROCKY HORROR from an experimental theatrical production to the biggest cult movie in history) but from a different perspective. Largely made up of interviews with an impressive number of past ROCKY personalities (many of whom were involved with the project from the beginning), this exhaustively researched book offers conjecture, bitterness, different opinions, and conflicting versions of the same stories. Some of these stories, many of us will already be familiar with (such as the ongoing 'feud' between Brian Thomson and Richard O'Brien, which certainly has no immediate resolution in sight) but quite a bit of it was new to me. I was a little concerned that the book might focus too much on the film (as is often the case with books on ROCKY HORROR), but the balance between SHOW and PICTURE SHOW is actually handled quite well. There is no interview with Tim Curry, which is disappointing but, let's face it, not really surprising, and a few others are conspicuous by their absence; but the sheer volume of people who have contributed makes it an essential read for anybody with even a passing interest in ROCKY HORROR. Rocky himself is represented by Rayner Bourton (yes, we get that infamous glitter story in explicit detail), as well as Peter Hinwood, and Trevor White (who provided Rocky's singing voice for the film). Scott admits to going on a "trannie hunt", and he managed to track down, and interview, the majority of the film's surviving Transylvanians. Sadly, the book does reveal how many people from ROCKY's history are no longer with us. Christopher Biggins is enthusiastic and co-operative as always, and reveals that he would love to play the Narrator in the stage show (what a brilliant idea); Sadie Corre has had an amazing film career, appearing in RETURN OF THE JEDI (as an ewok), WOMBLING FREE (as Madame Cholet), RETURN TO OZ (as a munchkin), the list goes on. It's also lovely to hear from Kimi Wong O'Brien (Transylvanian and Richard's first wife), and get her perspective on the whole thing. The book even lists the names of the stand-ins for the principal actors during the filming of THE ROCKY HORROR PICTURE SHOW, which the fan-boy geek in me absolutely loved. I would have liked more photographs of actual performers in costume, and stills from the various stage versions (definitely an idea for a 30th anniversary souvenir next year), but the pictures we do get, including a shot of the flat where Richard actually lived whilst writing the show, as well as Brian Thomson's beautiful little set models for the film, numerous candid photos of various ROCKY contributors, and a picture of Peter Hinwood (as he looks today) are more than worthy. The back of the book promises that it "brings the true fan completely up to date", which isn't completely true. There is very little detail about the recent stage tours or foreign productions, and the Broadway revival doesn't even get a mention, but, looking on the bright side, this means that there is still plenty of material for further books on the subject. 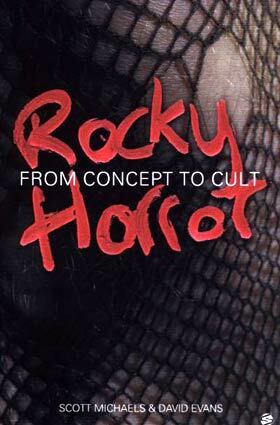 As there are so few books about ROCKY HORROR, it is very difficult to be objective when one does finally come along. However, ROCKY HORROR: from Concept to Cult, is an intelligent, insightful, and sometimes uncomfortable look at the talent, hard work and luck that goes into the creation of a legend, as well as the jealousy, tears, and strained relationships that ultimately accompany success. While it still does not quite tell the complete story, it is a fascinating and compelling read and no true ROCKY fan should be without it. Promotional Release suppied by the Publishers. London,1973: a new rock musical is premiered in a tiny theatre in Chelsea. Nothing remarkable about that; musicals open - and close - all the time. But almost 30 years later, The Rocky Horror Picture Show has grossed more than £100million on its way to becoming the most successful cult film and stage show in history. For the first time, the show's creator, its composer, the original stars of both stage and screen versions (household names like Meat Loaf, Susan Sarandon, Richard O'Brien, James Bond star Charles Gray, Tim Curry and countless others), the producers, technical directors and production crew reveal what it was like to be part of a cultural phenomenon. For some, it was the highlight of their careers; others disowned the project on completion. But nobody can ignore its success. Including original cast photos, unseen stage directions and movie scripts, this is the definitive account in the creators? own words. TW: Hmmmm! Their words not ours.